I have to admit that I am tired of mysteries set on cruise ships but this series is a winner and I enjoyed this latest offering. The characters are some of my favourites and I strongly suggest you read this series in order. I just love the Murder She Baked Hallmark Movies based on books by Joanne Fluke. Figured I would enjoy this Ellie Alexander mystery that seemed similar. The book bakes up deserts and even has a few recipes at the end. Murder takes place on a cruise ship where Jules has put on her Chef hat to help out her husband Carlos. This is an easy going read that blends romance, food, and "who done it?" 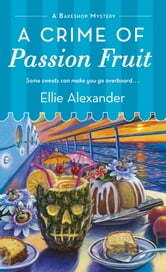 A crime of Passion Fruit is the sixth in the Bakeshop Mystery Series by Alexander. Found this to be a stand alone read with no loss of continuity not having read the previous five. Just failed to feel the passion of plot and characters. "A copy of this book was provided to me from St. Martin's Press via Netgalley with no requirements for a review. I voluntarily read and my comments here are my honest opinion." That's a realisation our romantic patissier heroine Jules Capshaw is increasingly coming to, and I think the same can be said for devoted readers of the Bakeshop Mysteries series. I'm going to miss Jules and her home town, quirky Ashland, OR, until the next installment of this delightful cozy mystery series. 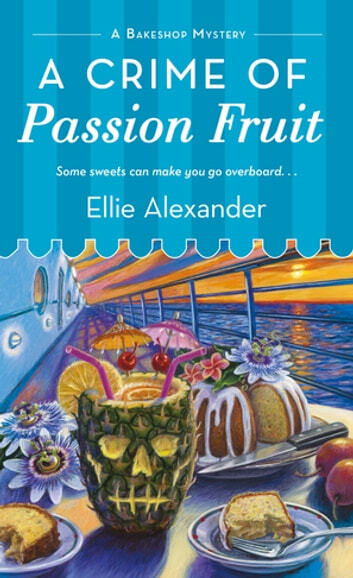 Having read all of this series in order, this one takes a break from Ashland and transports us to a cruise ship where Jules fills in as executive pastry chef for one trip, one that has been set up by Carlos. The carrot he dangled to get Jules to accept was to throw in a free trip for Jules Mom and the Professor. Of course, Jules gets herself involved in a murder and gets to help (this time by request) the Professor investigate and solve the case. There’s a lot going on in this book and the action is never ending. Once again, Alexander’s writing skills had me feeling the rocking of the ship as it weathers a severe storm, I tasted the luscious deserts Jules planned for the ship’s guests, and I could feel the continuing attraction between Jules and Carlos. I was sad to see this one end, but am delighted to know that there’s another one coming our way.